For the first time in 15 years1, the Colorado School of Mines has a snow day. 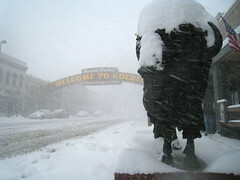 Due to severe weather and treacherous driving conditions, Colorado School of Mines will close today (March 26) at noon. And it really wasn’t a full day either, just a half day. Still, I somehow feel my college experience is now more complete. Rumors are circulating that tomorrow may also be a snow day, but I have my doubts. Yeah it’s amazing, a *half* snow day for once! Although greatly appreciated, it was kinda late for them to call it then… endangering tons of students who have to drive on the streets sheets of ice to get there on time for classes and exams. But I guess that’s to be expected from a school that seemingly never stops for anything to complete it’s mission: to heat students to white hot temperatures in their fiery forge, while repeatedly pounding, pressing, and rolling them into a form of freakishly intelligent hyper-beings known as engineers. All of this while force feeding them concentrated stress and attempting to leech all hope from them. it can be speculated that this must be the 30 year snow event seeing as 50% of a day was canceled in 15 years. Strangely I remember a significantly worse snow storm before my time at mines but I believe that that particular event was during spring break, irony is such a cruel master.